This printable cruise line complaint letter addresses poor service. 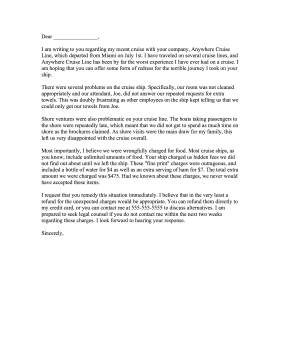 I am writing to you regarding my recent cruise with your company, Anywhere Cruise Line, which departed from Miami on July 1st. I have traveled on several cruise lines, and Anywhere Cruise Line has been by far the worst experience I have ever had on a cruise. I am hoping that you can offer some form of redress for the terrible journey I took on your ship. There were several problems on the cruise ship. Specifically, our room was not cleaned appropriately and our attendant, Joe, did not answer our repeated requests for extra towels. This was doubly frustrating as other employees on the ship kept telling us that we could only get our towels from Joe. Shore ventures were also problematic on your cruise line. The boats taking passengers to the shore were repeatedly late, which meant that we did not get to spend as much time on shore as the brochures claimed. As shore visits were the main draw for my family, this left us very disappointed with the cruise overall. Most importantly, I believe we were wrongfully charged for food. Most cruise ships, as you know, include unlimited amounts of food. Your ship charged us hidden fees we did not find out about until we left the ship. These "fine print" charges were outrageous, and included a bottle of water for $4 as well as an extra serving of ham for $7. The total extra amount we were charged was $475. Had we known about these charges, we never would have accepted these items. I request that you remedy this situation immediately. I believe that in the very least a refund for the unexpected charges would be appropriate. You can refund them directly to my credit card, or you can contact me at 555-555-5555 to discuss alternatives. I am prepared to seek legal counsel if you do not contact me within the next two weeks regarding these charges. I look forward to hearing your response.